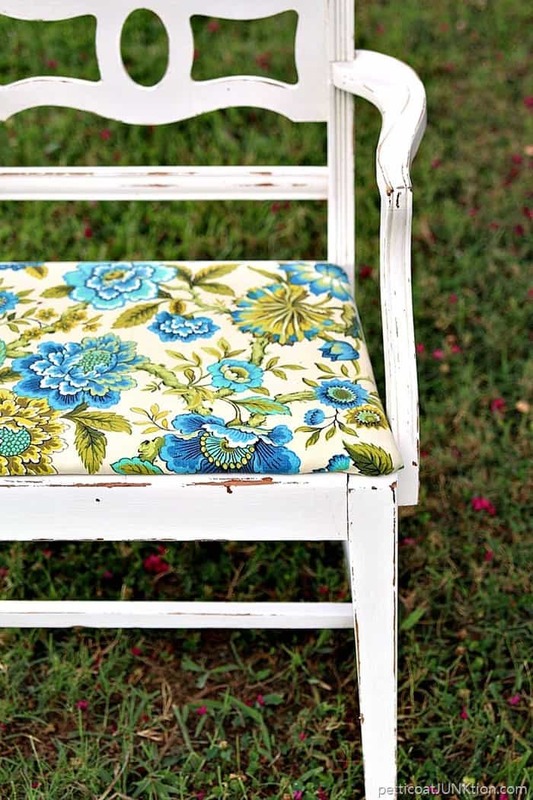 Did you know you can change the whole look of a chair by just changing the fabric? That’s what I did with this chair. It’s much prettier now. I don’t know if it looks like a million but it’s close. 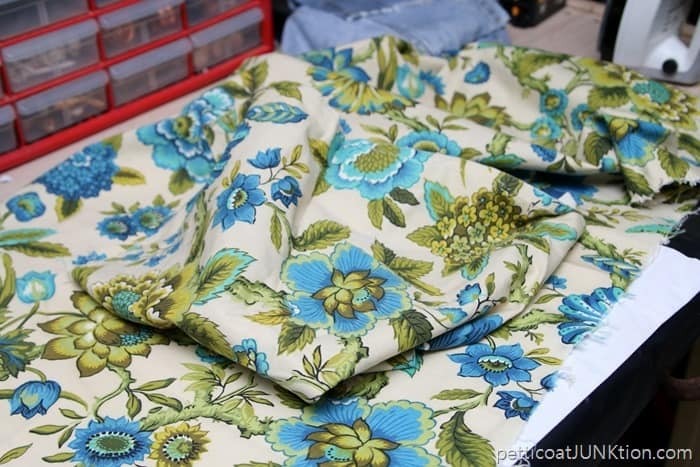 The process of changing the fabric is super easy and really fast. 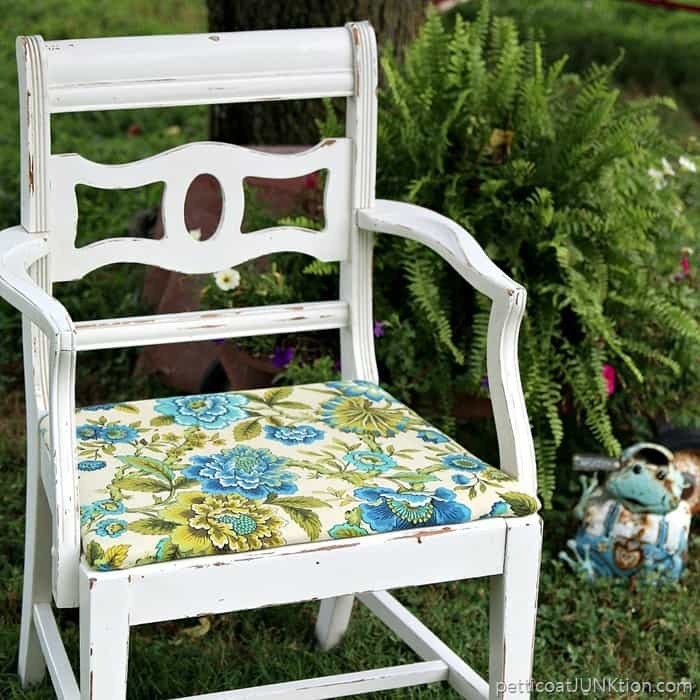 I started this project thinking I would use the watercolor paints on drop cloth and cover the seat with the drop cloth. Things went totally sideways. The chair is from my favorite junk shop and I paid $10 for it. The first thing I did was remove the seat. I used a screwdriver and removed four screws on the bottom side of the chair seat, one on each corner. Then I distressed the paint by hand with 80 grit sandpaper. The paint was already a bit scuffed up and I just added to it. Sorry but no pic of the process. This is where the project took a turn. I walked by one of my many junked up areas in the shop and caught a glimpse of this fabric. I bought it at the junk shop too. I’m not sure of the price but probably around $1 for the bag of scrap pieces. I decided not to paint the drop cloth and to use the pretty fabric instead. I mean, look at those colors. I love the various shades of blue and turquoise and green. After ironing the fabric I laid the chair seat upside down on the fabric and cut a piece big enough to staple on to the seat. After stapling one side of the fabric I stapled the opposing side pulling the fabric tight while stapling. Then I moved on to the other two sides of the chair seat. Last thing to do is gather the corners as smoothly as possible and staple them down. Ta-dah. 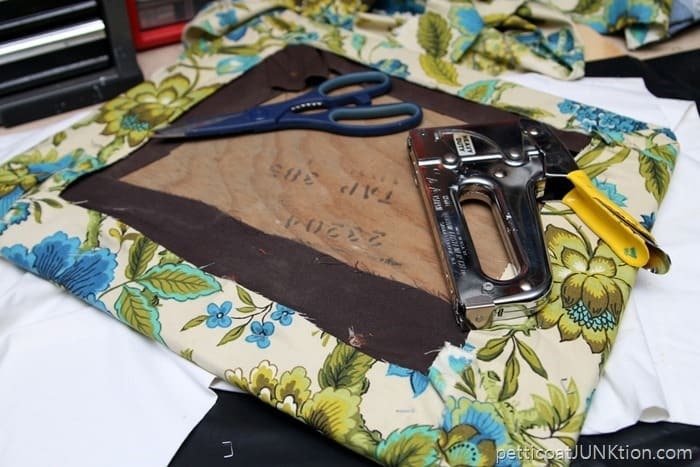 The process of stapling the fabric to the seat takes maybe 5 minutes, 10 tops. Now you just have to screw the seat to the chair. How easy was that and how different the chair looks now. The cost of the chair and the fabric was no more than $11. That’s not bad for a solid wood chair with arms. 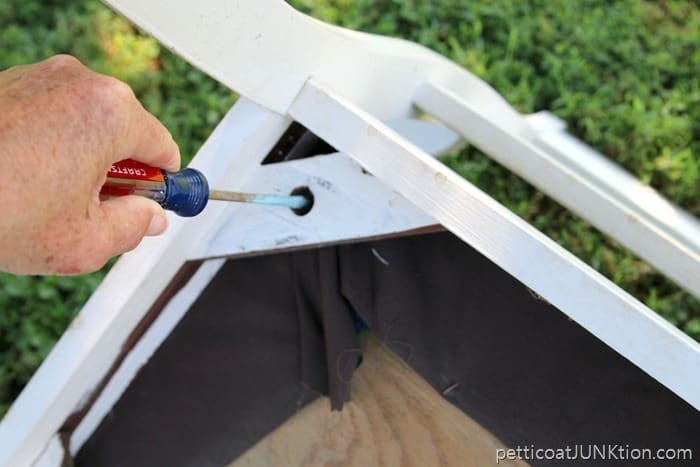 Have you re-covered any chair seats? I can’t tell you how many I’ve worked on in the past few years. When we lived in Florida we had a dining room set I gave new life to by covering the chair seats with a beautiful fabric. I don’t have photos of that because it was before my “blogging” days and “taking photos of everything” days. The dining room furniture we have now has wood seats. Those chair cushions cost a lot more than covering fabric seat chairs. The cushions aren’t something you can change out with the seasons or every year or two because of the cost. 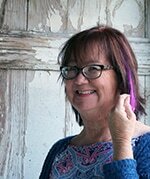 So what do you think of the makeover. Leave me a little note and I will try to reply soon. I’m actually on vacation with hubby visiting our daughter and grandson. I’ll be back soon. Have a great day! I haven’t done a job like this yet, but I’m sure I will someday! (There’s a few things in MY garage that need a little attention.} I love what you’ve done. I like the fabric and the shape of the chair. Great makeover! Love it! What kind of stapler did you use? 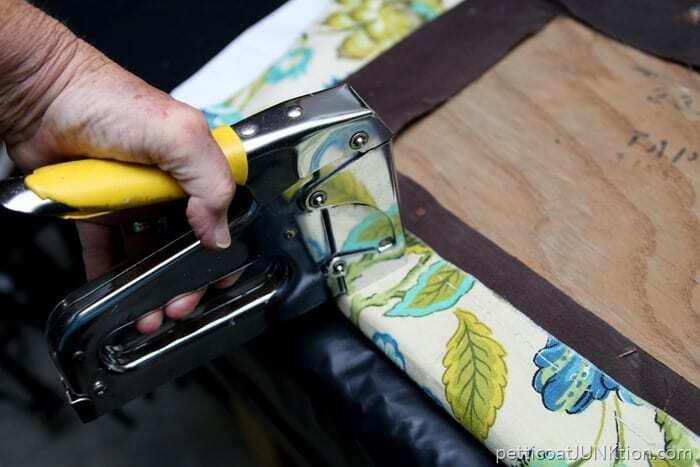 Do you ever add cushioning to the seats before recovering them with fabric? 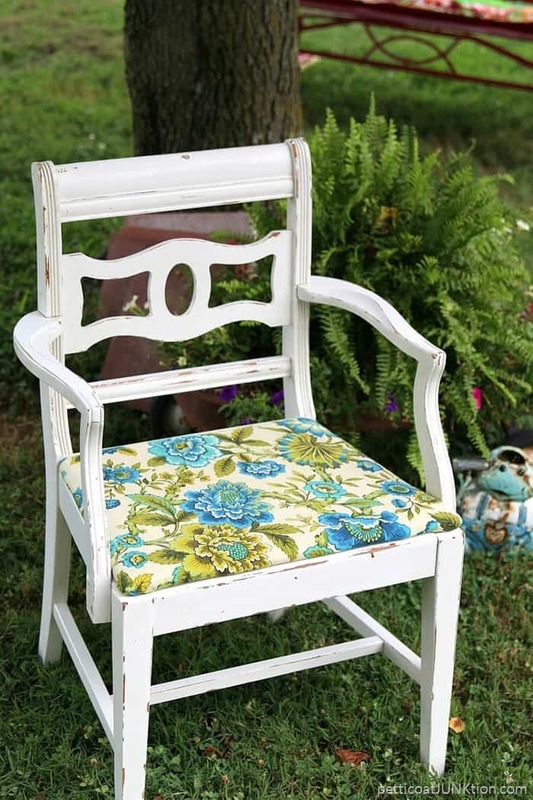 Love the chair and the bright fabric. I am also redoing a chair with a bright blue floral pattern but it’s a little bigger chair. I’m curious as to the stapler you use, that’s the hard part of redoing chairs. 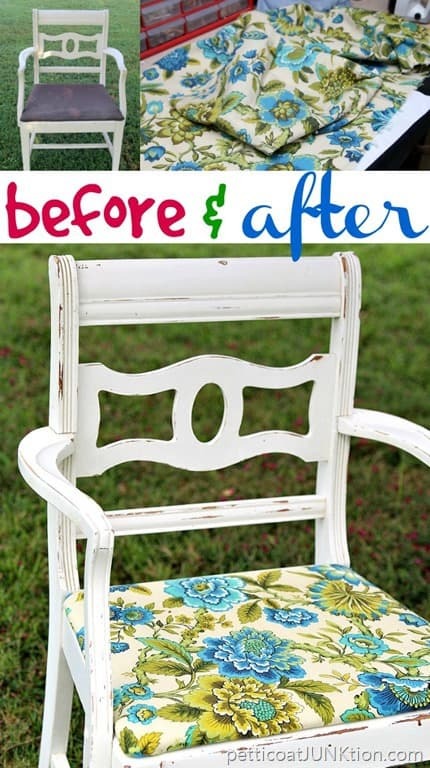 That’s a “wow” chair makeover, for sure. Love that fabric and the the chair has the prettiest design. Isn’t is satisfying to see that finished item? I have about 20 ( ok ,maybe more) of those projects waiting for my attention…you’ve inspired me to start on one. You make everything so beautiful… reminds me of a scripture I love. Love the colors and the chair. 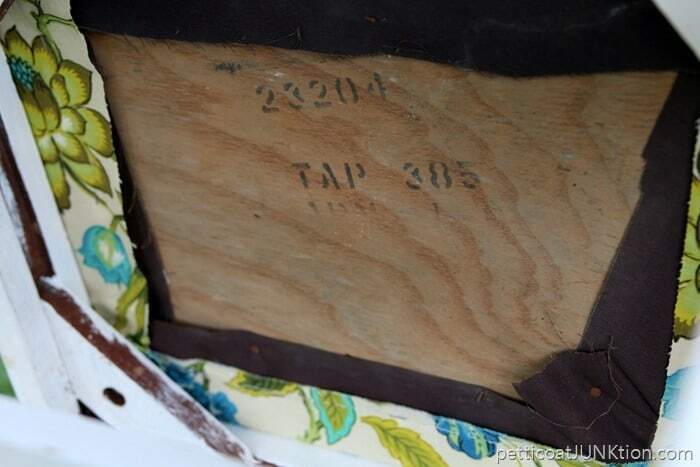 I wonder if it was part of a set that went with a duncan phyfe table like my grandmother had…. So cute and you made it look so easy. Turned out very cute…LOVE the fabric you chose too. 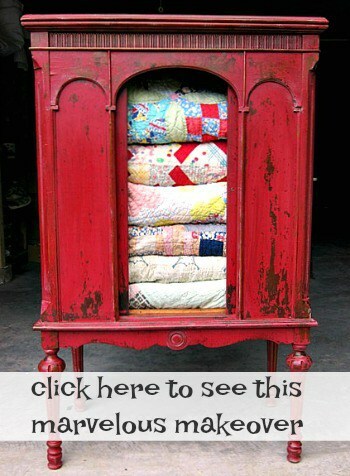 I am wondering however….why did you not remove the old fabric? 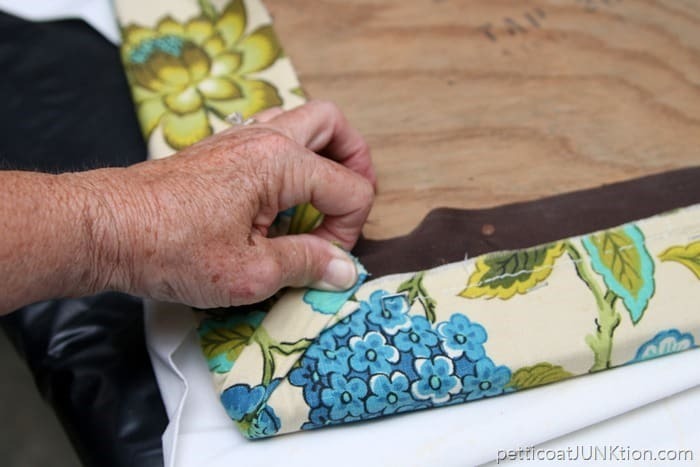 After taking the seat off the chair, that is the first thing I do….take off the old fabric. 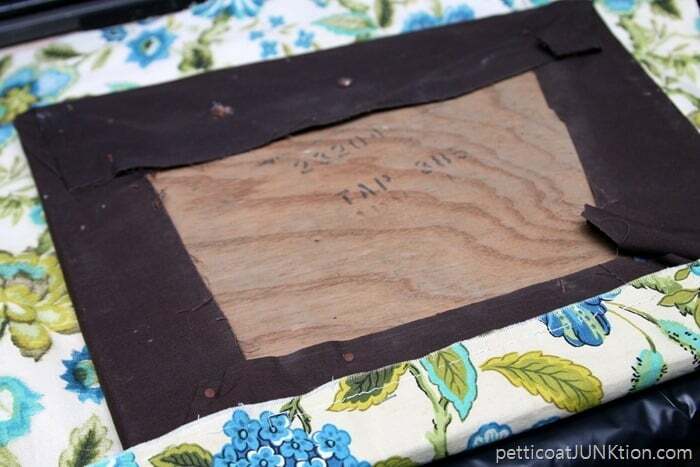 Never know what was spilled on that old fabric and padding so I always replace all of that. White painted chairs with fabric seats are a thing with me – I have lots! If they are all white it doesn’t matter if you have three of one design and three of another. My Dad used to cover the dining room chair seats every year because we children were so messy – finally he covered them with clear plastic so that he didn’t have to do it. Since I had watched him do it so often I knew how and over the last 28 years of home ownership I’ve covered tons of chairs for myself and for my friends. 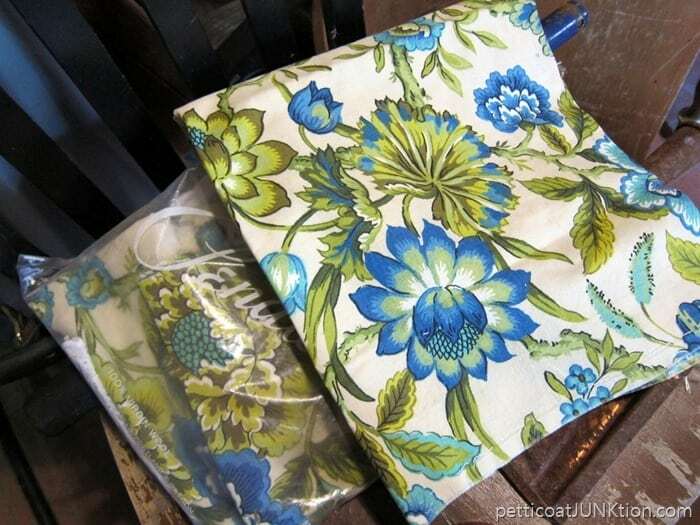 The hardest task was that I took an old, old matelasse pillow cover that had belonged to a great-aunt and was shredded at the edges and covered two chairs, matching the fabric pattern perfectly so that the same motif occurred in the same place on each chair. 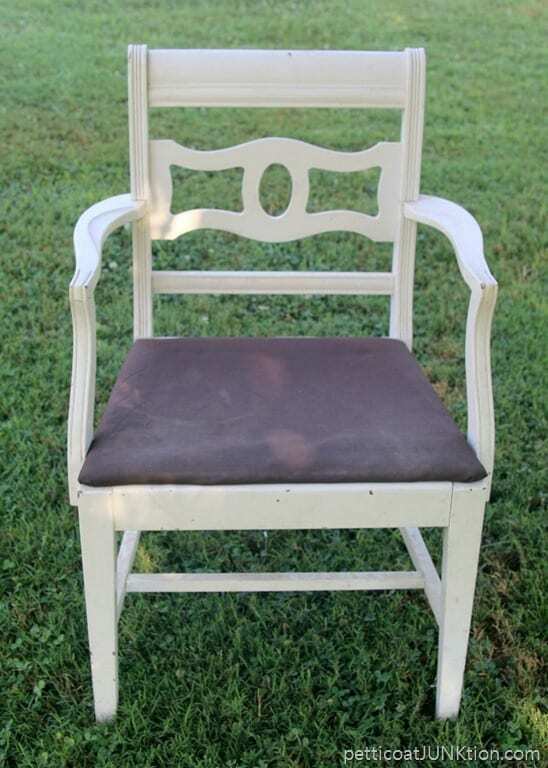 I have a set of six chairs waiting to be painted and reupholstered that have webbing, so that’s my next skill to learn. Looks great. I love the fabric. It would make some very pretty pillows too. I love the fabric, beautiful colors! Your chair looks very high end!! 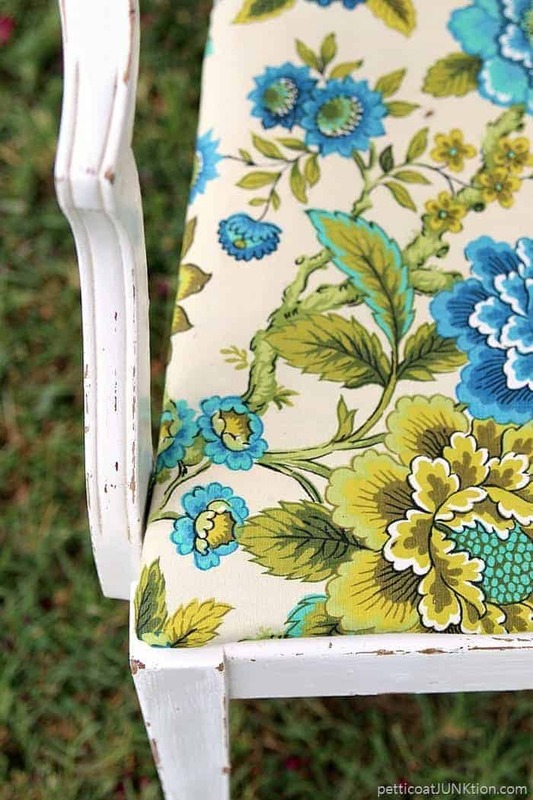 I love the fabric you used on this chair. Very pretty!